This study examines whether the American commitment to volunteerism and charitable giving is as evident among U.S. retirees in other countries as it is in the U.S., and in particular, how committed U.S. retirees in their adopted Mexican communities are engaged in civic engagement and charitable giving. While the pool of potential baby boomers engaged in voluntary service is expected to grow in the coming years, not everyone in that population is expected to remain in the United States. In fact, due to the rising costs of retiring in the United States, a growing number of American retirees are opting to retire overseas. And, among overseas retirement destinations, Mexico is considered one of the most preferred retirement locales because of its affordability, lifestyle options, and its close proximity to the United States. To better understand perceptions and lifestyle trends of U.S. retirees in Mexico, the International Community Foundation conducted a comprehensive study of U.S retirees in Mexican coastal communities between July and November 2009. A key focus of this research included an analysis of civic engagement, volunteerism and charitable giving trends among the U.S. expatriate community. The target populations surveyed were those aged 50 years or older who are now either retired full time in Mexico or residing there on a part-time basis. Several key findings emerged from the research. 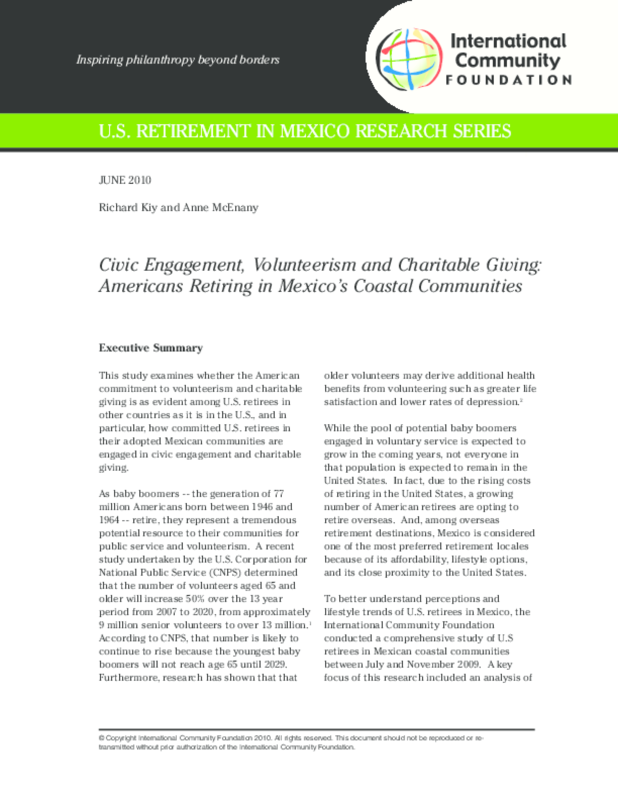 Volunteerism and giving to charity is as robust among U.S. retirees living in coastal Mexico as it is among retirees in the U.S. This is especially noteworthy since relatively few of these donors receive a tax deduction for their gifts. Respondents not only give in Mexico, but continue to give in the U.S. as well. These retirees volunteer because of their strong sense of social responsibility, and desire to make a difference in their communities. They report that their volunteer efforts increase their sense of belonging in Mexico, and contribute to an increased sense of community among local neighbors and friends. Respondents engage in a wide range of volunteer activities, most prominently with education-focused charities, community projects, and the environment. Social issues such as poverty, stray animals, economic challenges, unemployment, and lack of educational opportunities for youth concern them. Many retirees are willing to get involved to solve such problems, and report they would even consider Peace Corps service should the program be expanded to include retirees. Despite their inclination to be civically involved, there is a gap between U.S. retirees and Mexican-led nonprofit organizations in Mexico. Many respondents to this survey indicated that they were more likely to start their own nonprofit or to be involved in nonprofits created by other expats than to engage in work with a Mexican nonprofit. This could be due to doubts retirees have about the accountability and transparency of Mexican nonprofits, which often exist in a nascent state. Factors such as cultural misunderstandings and language barriers may also influence the willingness of retirees to engage with Mexican nonprofits. Yet, despite these findings, many U.S. retirees have a favorable impression of Mexican nonprofits in terms of program strength and effectiveness. Nevertheless, the potential for connection between retirees and Mexican communities is rich. Many retirees are willing to consider not only volunteering and giving, but planned giving and property bequests to Mexican nonprofits. At this time, Mexican nonprofits have a limited capacity to leverage this valuable resource. Thus, there exists a very real potential, for the gap between Mexican nonprofits and the U.S. retiree community to increase. This report makes a number of specific recommendations for both Mexican nonprofits, and U.S. policy makers to make improvements and promote future collaboration in volunteerism, philanthropy, and civic engagement. Copyright International Community Foundation 2010. All rights reserved. This document should not be reproduced or retransmitted without prior authorization of the International Community Foundation.